Welcome to the summer edition of No Croutons Required, a monthly event co-hosted by Jacqueline of Tinned Tomatoes and myself. As folks are busy during the summer, we extended the challenge to two months instead of one. I know that I haven't been cooking very many new dishes as it has been a scorcher this year. However, take a look at these lovely offerings from other cooks. Thank you to all who contributed your dish. My contribution this month is an easy and nourishing pasta tomato soup. 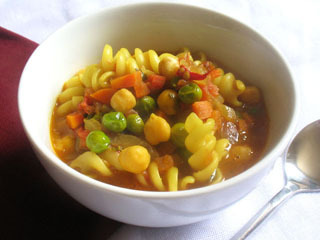 The texture of this soup is a joy in every bite, as this bowl features not only tomatoes and quinoa pasta, but also buttery chickpeas, carrots, green peas, some of my favourite spices and fresh herbs from my garden. Serve it up with some crusty bread and you are all set for a satisfying lunch or dinner. 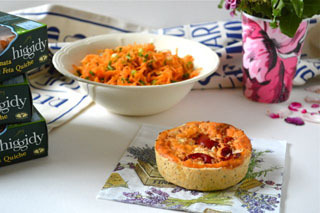 Perfect for a summer picnic, next up we have this lovely carrot salad. Grated carrots are all dressed up with zingy orange and lime, along with some ginger, spring onions or chives if you please and olive oil. It's best when marinated for at least a few hours. Serve up with some quiche or veggie rolls and you are in for a treat. Johanna has been a long time contributor to NCR and her recipes are always so tempting. I too think it's a shame wasting leftovers and this creamy soup makes a fine use of them. Roasted pumpkin and potatoes come together here with celery, red pepper, zucchini, garlic, cauliflower cheese, rice and some cheddar cheese. Yes, please. Zucchini is truly in abundance at the end of the summer, and what better way to showcase it in this easy weeknight meal. 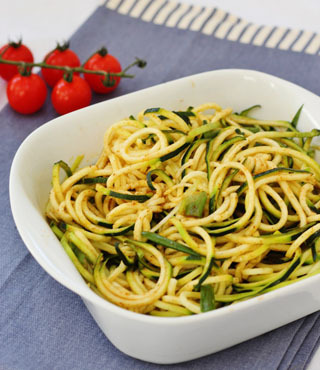 Spiralized zucchini and spring onion is all dressed up with lemon juice, olive oil, peppery baharat spice mix and some garlic. Sounds like a fine use of my neglected spiralizer. 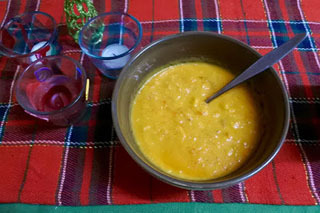 This creamy and earthy soup I would enjoy anytime of year. I too like soups during the summer months. 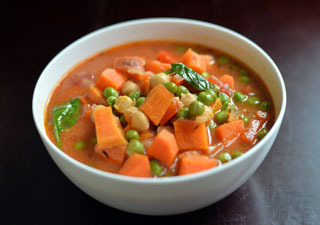 This beautiful bowl includes shallot, garlic, carrots, red pepper, sweet potato, tomatoes, 10-spice mix, nutritional yeast, peas and chickpeas. Make extra and freeze some for later. Yum. 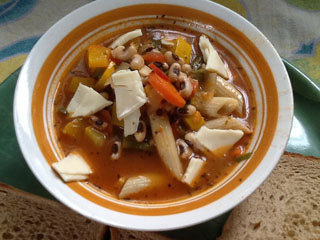 Next up is a hearty soup that will nourish and fill hungry tummies and it's loaded with vegetables. Garlic, onion, tomatoes, carrots, green beans, squash, pumpkin, spinach, penne pasta, black chickpeas, some seasoning and some cheese slices complete this bowl of nourishment. This soup is surely a satisfying one-pot meal, especially if you serve with some crusty bread. 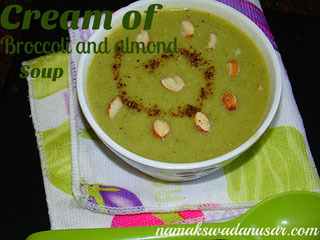 Broccoli is super good for you and it's especially delicious when made into a creamy soup. Add some onion, garlic, some simple seasoning, blend it all up and add milk and cornflour and garnish with some sliced almonds. That's a fine way to eat your greens. Next up is a creative salad celebrating the spirit of the olympics. 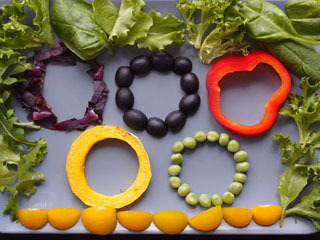 Here the colours of the olympic flag are represented in this fresh salad. Rosini lettuce, purple basil and purple chilli chopped up, black olives, red bell pepper, roasted gem squash and fresh peas. Everything on this plate is appealing to me. This versatile and nourishing salad is made with homegrown vegetables. 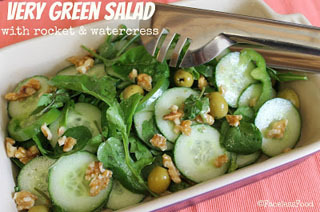 Simply mix together some rocket and watercress, lettuce and spinach, toss in some cucumber, green pepper, olives and walnuts and dress it up with olive oil and some fresh lemon juice and a bit of seasoning. Surely a fine lunch or side for dinner. Our final submission contains some of my favourite vegetables. 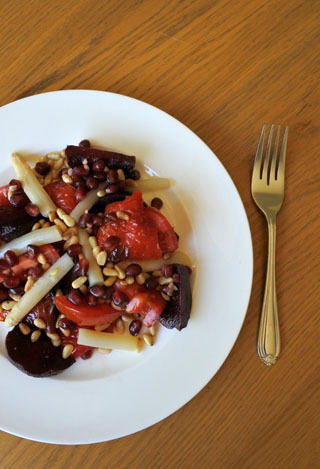 Roasted red pepper and beetroot come together with white asparagus, tomatoes, pomegranate seeds and some cider vinegar and pine nuts. The addition of sweet pomegranate and pepper balances out the bitterness. That's one irresistible lunch for sure. And that concludes the summer roundup. My good friend Jacqueline is hosting the September edition. Be sure to see her announcement to share your recipe this time around. You are making very good recipes. All looks very nice.